Global education allows you to view the world from different lenses; to develop a sense of empathy that is essential as part of the human spirit. The question is, how do we do that? Where do we start? This presentation will give tips on how to incorporate global issues into curriculums with specific examples that have worked in a science classroom. From weekly hot topics to in-depth project-based learning initiatives, globalizing your curriculum exposes your students to life outside the walls of their school and helps to foster curiosity of other cultures and countries. It’s important for our students to develop the perception that there is unity within diversity and give them a sense of belonging to a larger world community. The powerpoint that accompanied this presentation is here. Please feel free to follow up with me regarding questions about the content found within. I am happy to help! My students have been working through their latest #pbl in my honors Biology classes. We have been focusing on Mendelian and Non-Mendelian Genetics in class while they have independently been working on their human genetics disorder #pbl outside of class. The project started with my students doing basic genetic disorder research on the most common human genetic disorders that genetic counselors will see. They were to pick 21 disorders to do very basic, introductory research on so that they could identify possible areas of interest for their PBL activity. From this research, they were asked to identify a disorder that they wanted to learn about in depth. Each student then worked independently to learn about their disorder and plan a presentation for their peers about this disorder. I gave them a detailed rubric of required content that I wanted them to research so that I knew they were going deeply enough into their research, but the way in which they presented to their peers was up to them. While most students will use powerpoint as their medium, I have had students use Prezi, create a digital storyboard, make a brochure, create a video with voiceover, etc…they never run out of creative ways to present information. The #pbl aspect of this project came into play when I let the students know that they are going to function as genetic counselors who will be counseling their patients through a diagnosis of the disorder that they have each been researching independently. I explained that they will need to write a detailed letter to a family explaining that they have been diagnosed positively with this disorder and present to the family all of the necessary information and options that they will have. I also explained that this is where they need to pull in their emotional intelligence and work from a place of empathy and understanding. A large portion of the disorders researched were terminal and affected children, this is a challenge for them to be able to do in a professional and caring manner. I had a local genetic counselor come in to talk with my students about the process of diagnosing someone and counseling them through that diagnosis. The letter written by the students serves as their summative assessment for this unit.I really love this experience for the students and I always receive good feedback from them about the process and what they learn. To make this a true #pbl experience for my student, I am going to ask Dr. Fulk (pictured above) to have some of the counselors in her office review the letters that my students write and ask them to provide some valuable feedback on their writing and the process. My Biology II students are completely immersed in what started as a fictitious PBL about toilet designs and sanitation and has morphed into something much bigger, and so very awesome. Below, is a blog post that was written about my students by one of our library scientists, which discusses their progress thus far. I will come back and add information and photos as we move along, but these kids are going to make an amazing toilet to help solve issues surrounding sanitation and safety with regards to proper access that will make a difference. I am bursting! It’s true. Everybody poops. It’s also true that 2.6 billion do not have access to clean water or adequate sanitation. In response to that distressing problem, Shayna Cooke’s Biology II students are exploring ways to design an inexpensive, light, and easy-to-use toilet for densely populated regions in India. 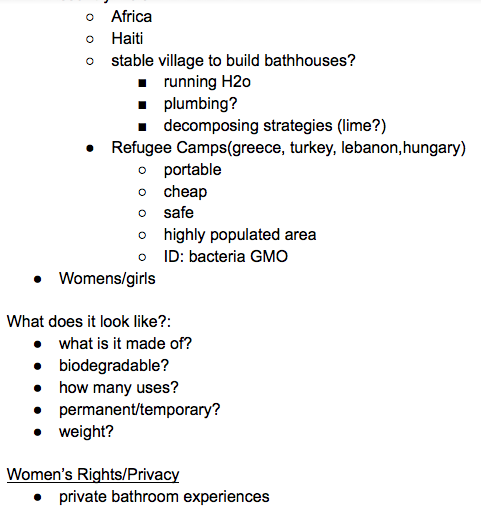 Prior to the Skype session, the Bio II students brainstormed potential user groups, researched existing toilet options and developed questions about materials, privacy issues, and cost. The students talked with Jasmine Burton, founder and president of Wish for WASH, about her experiences and current work with Wish for WASH and the Society for Family Health in Zambia. Burton, a recent Georgia Tech Industrial Design graduate, considers herself a empathic designer, who places emphasis on getting to know a product’s users in order to design for and exceed their needs. 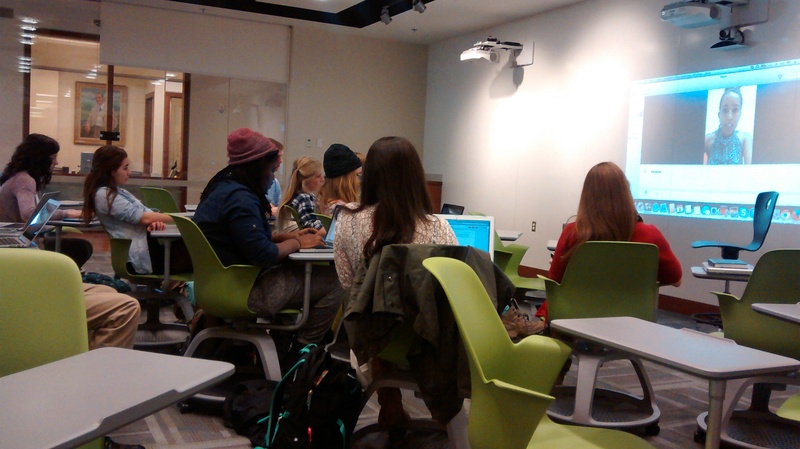 Burton talked about the importance of getting to know one’s users before embarking on design. What’s the point of designing and building something if the product is not going to be used. Burton also discussed how important behavior change and incentivizing that behavior change can be in getting people to accept and use products. The students also considered the different user groups designers need to consider. Not only do designers think about the person using the toilet, but they also ask how they design for the person who may be disposing of the waste and how that disposal affects the population. Based on their research and the information they gained from their talk with Burton, the Bio II students will now design a prototype of a toilet. They plan to talk with Burton again once their prototype is finished. Burton cheered on the students’ desire to build a prototype by saying that research and ideas are awesome, but making something and bringing something into the world matters. The testing of a physical thing matters and can result in so much knowledge.